Should a child under the age of 5 years old drink skim milk instead of whole milk or 2 percent milk? The American Academy of Pediatrics advises that parents can begin low-fat milk after the age of 2 years. Learn when it's appropriate to start your child on different kinds of cow's milk. Before the age of 12 months, a baby should either be breastfeeding or drinking an iron-fortified infant formula. Cow's milk is not appropriate for babies because it doesn't provide enough of certain nutrients. It is also hard for babies to digest due to its content of protein and fat. After a child is 1 year old, you can introduce cow's milk. Before your toddler is 2 years old, unless he has a milk allergy, he should be either breastfeeding or drinking whole milk. After age 2 you can start giving him 2 percent, 1 percent, or skim milk, especially if your child is overweight. The USDA recommends 2 cups of milk daily for age 2 to 3 years. For ages 4 to 8 years, they recommend 2 1/2 cups of milk per day. In general, they recommend fat-free or low-fat milk and dairy products for all ages above age 2. A reason to switch to low-fat milk is that your child will likely be getting plenty of fat from other things that he is eating. Starting early can help your child develop preferences for low-fat foods that he will hopefully keep for a lifetime of healthy eating. If your child doesn't get enough fat from other areas of his diet, then you may want to keep him on whole milk. Keep in mind that by the time a child is 4 to 5 years old, he should be getting about one-third of his calories from fat. 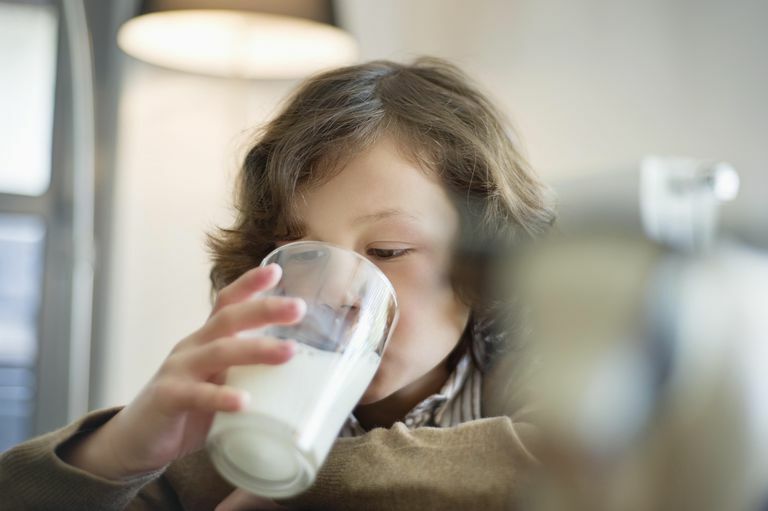 If your child isn't, then staying on whole milk may be a way to boost his intake of fat. But that isn't a problem for most children, especially with the current epidemic of obesity. If your child is already overweight, a change to low-fat milk can be very important to reduce the amount of fat and calories that he is getting. Milk is still an important part of a healthy diet for these children. It can be a big change to go from whole milk to skim milk, so it is better to make a more gradual change. You might try to go first to 2 percent milk and then 1 percent milk, and finally to skim milk. Starting early can also help to ease this transition to low-fat milk. A 2-year-old who really likes to drink milk will probably be more accepting of low-fat milk than a school-age child might. American Academy of Pediatrics Committee on Nutrition. Complementary Feeding. In: Kleinman RE, Greer FR, eds. Pediatric Nutrition. 7th ed. Elk Grove Village, IL: American Academy of Pediatrics; 2014: 135. Cow's Milk and Children. MedlinePlus. Are They Still Putting Growth Hormones in Milk?